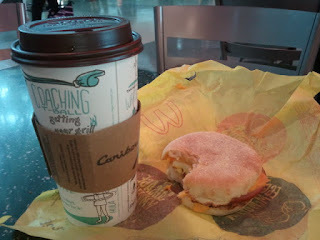 Livliga® Live Vibrant Blog: Airport Breakfast That Works for 420 Calories! It is always hard to eat right when you travel. Even when you do it regularly it seems "special" and not part of the usual routine. This sets me up for eating more than I should or the wrong things. The problem is always the sense of being denied something I desire...bad head space. So how to find something to eat in an airport that isn't too bad for you, feels kind of "special" and fits with in the acceptable calorie range. And, of course, it has to be satisfying so I feel full and won't want more to eat. I think I have found something...it requires standing in two lines, but for me it is worth it. I buy the Starbucks latte (or Caribou) first- a grande skinny with sugar-free Vanilla and sugar-free Hazelnut coffee syrup in to make a "Skinny French Vanilla Latte" (120 cal). Then I go to McDonalds and buy the Egg McMuffin Sandwich (300 cal). It seems like a splurge to me and the total calories are- 420. What I like about it is that I can also make it part of my routine. That helps me avoid the temptation of choosing something to eat that is even worse for me and has many more calories. This is a routine I can stick with!